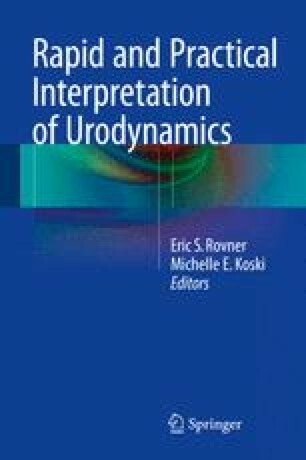 Proper reading and interpretation of a pressure-flow urodynamic tracing should proceed in an orderly and organized fashion. Unfortunately, such a systematic approach to the interpretation of a pressure-flow urodynamic study does not currently exist. Using the functional classification of voiding dysfunction as a framework, the pressure-flow tracing can be dissected into a filling/storage portion and an emptying portion. Important aspects of the urodynamic study can be sub-classified within each of these phases. Conveniently, each of these aspects can be titled with a “C” thus providing the 9 “C’s” of pressure-flow urodynamics (PFUDs) interpretation. Such a scheme allows a complete and pragmatic approach to the interpretation of the urodynamic tracing.